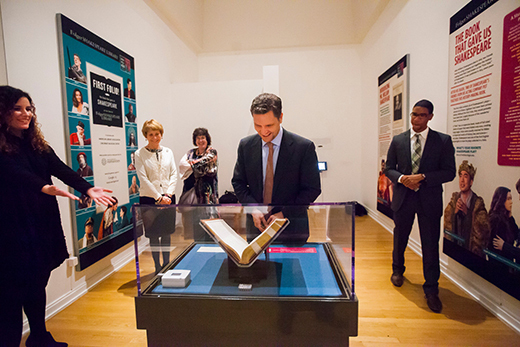 Michael Witmore, director of the Folger Shakespeare Library, visited the First Folio exhibit at Emory's Michael C. Carlos Museum on Dec. 5 while on campus for his lecture, "The Wonder of Will." 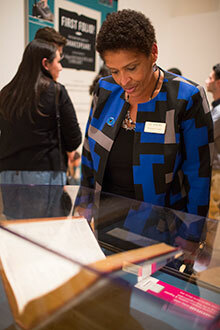 Emory University Librarian Yolanda Cooper views this First Folio, which is on display in the Carlos Museum through Dec. 11. Emory University received accolades from the director of the Folger Shakespeare Library on the “First Folio! The Book that Gave Us Shakespeare” exhibit at the Carlos Museum and the extensive, collaborative programming across campus departments and units. Folger director Michael Witmore made the comments while he was on the Emory campus Monday, Dec. 5, for his lecture, “The Wonder of Will.” The lecture was part of the closing salute to the First Folio exhibit, which will end on Sunday, Dec. 11. An engaging speaker, Witmore discussed the Bard’s enduring popularity and writing prowess, as well as how Shakespeare’s words and plotlines have permeated changing mediums and popular culture over the past four centuries. More than 200 people from the Emory and Atlanta communities attended Witmore’s talk. Witmore said he wanted to mark the end of the First Folio’s national tour at Emory to learn more about the cross-campus collaboration and programming during Emory’s Year of Shakespeare. Events included lectures and performances open to the public, an evening for educators, and a symposium on Shakespeare and accessibility. Emory Libraries has hosted seven events and eight exhibits since March 2016, including displays of Bard-inspired items in popular culture and postcards of 19th-century Shakespearean actors. “To the Great Variety of Readers: Publishing Shakespeare” focused on the Second, Third and Fourth Folios, as well as other examples of early English printing; the exhibit will return to the Rose Library April 3-May 15. Emory is the only site to display the Second (1632), Third (1663) and Fourth Folios (1685) alongside the First Folio, made possible by a loan of the Second and Third folios from Rose Library benefactor Stuart A. Rose. Shakespeare at Emory programming will continue through this academic year, with a variety of activities, presentations and exhibits hosted by the Carlos Museum, Emory Libraries and Theater Emory. “Emory Libraries is proud to have been part of this Shakespeare celebration and to provide the campus and Atlanta communities the opportunity to experience such an important part of history,” said Emory University Librarian Yolanda Cooper. The First Folio has traveled to all 50 states and two U.S. territories since January 2016, and each exhibit featured the book opened to Hamlet’s “To be or not to be” soliloquy. More than 500,000 people have seen the First Folio in person on this tour, Witmore said. Why send out such a rare and precious book from the non-circulating Folger Library? Witmore said that since the Folger has 82 copies (out of 234 known copies that exist), library officials felt they could safely send out a few copies for a cross-country tour — using the utmost security and climate-controlled means. Why does Shakespeare’s work continue to fascinate us more than 400 years later? Shakespeare’s universal themes of love, betrayal, greed and revenge have been remade many times through multiple mediums, from books and plays, to silent films and talkies, to radio, television, movies and beyond. Witmore said the Netflix series “House of Cards” is based on “Macbeth” with dashes of other Shakespeare plays, as is the Fox series “Empire,” which also taps “Othello” and “The Lion in Winter” and borrows a phrase from a Shakespeare play for the title of each episode. Witmore added that Shakespeare’s world was in the process of becoming our world today. Along with the printing press and the media change it brought, issues of race, international trade, science, religious tolerance, freedom of the press and of expression and inquiry were becoming a reality.